Advertising dollars are scarce in the best of times. Competition is always fierce. But in today’s economy, can any businessperson afford to squander his limited advertising budget? There have never been more places for advertisers to gamble with their ad dollars. Those who are attracted to novelty (“the grass is greener”) are especially vulnerable to salespeople with a new gimmick and a slick pitch. The sheer number of competitors for local ad dollars is matched only by the mind-numbing stupidity of some of these new alternative forms of advertising. 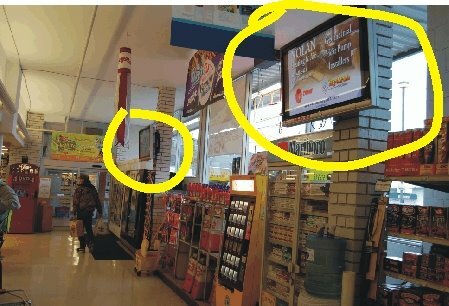 For instance, over the past few years I’ve watched and winced at the efforts of one company whose business is selling video ads—visual display only, no speech or sound—that run on video monitors mounted on the wall of a grocery store opposite the check stands. I’ve seen these things in stores throughout the region, including my favorite local supermarket here in town. Nothing wrong with these stores. They’re simply providing space and receiving compensation for hosting the monitors, which are operated and maintained by the ad company. For the supermarket, it’s just good business—leasing a little space to a third party helps pay the bills, while providing a service to their customers, whether it’s a Redbox DVD dispenser, a Coinstar machine, or a carpet cleaner rental depot. But my interest in this particular enterprise is that of a working advertising professional. I note and observe these things with a critical eye, always wondering, How’s this working for the advertiser, compared to alternative forms of advertising? 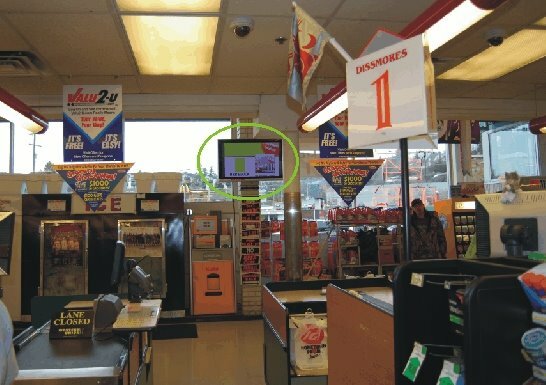 The video monitors are mounted eight feet or so above the ground, spaced 20 or 30 feet apart at the end of the checkout lanes (see photo below). I’ve stood around paying close attention to see if anyone even glances at these things, let alone watches them long enough for an impression to register. Drives me crazy to see all the advertisers they’ve bamboozled, including a few regular radio advertisers but more than a few who have never spent a dime on radio. Isn’t anybody calling on them? Some of the advertisers who’ve bought this package did so on the basis of a telephone pitch; others had the privilege of visiting with the salesperson face-to-face. Either way, they sign up for a 3- or 6-month contract and wait for the results to come flooding in. And at the end of the contract, they bail. Based on my observation over the past three years or so, and corroborated by advertisers I’ve talked to about their experience, the renewal rate appears to be: ZERO. No measurable response, no return on investment…no renewal. However, at the very least it provides an opportunity for a conscientious Radio advertising professional to help a business in dire need of better advice. What similar opportunities exist at this moment in your market? If you’re in the business of selling radio advertising these days, you’re presumed to be in the business of providing solutions to your advertisers’ business problems—increasing traffic, creating awareness, helping to ring the till. Undoubtedly I’ve only skimmed the surface. What other competitors have you run into in your market? Please feel free to share them by means of the Comment function below. Rod Schwartz backed into a lifelong career in radio advertising in 1973 in Springfield, Illinois. He became sales manager for the Pullman Radio Group in 1979 and served in that position until 2006. He continues to serve clients in the region as the stations’ senior account executive. Since 1991, Rod and his family have operated Grace Broadcast Sales (GraceBroadcast.com), providing short-form syndicated radio features to radio and TV stations across the U.S. and Canada. Rod also operates an independent advertising, marketing, and communications consultancy for small business owners and professionals, FirstStrikeAdvertising.com. An avid photographer, Rod shares some of his favorite images of the Palouse at PalousePics.com and on his Viewbug gallery. This entry was posted in Advertising (General), Radio Advertising, Sales & Marketing and tagged Advertising, Competition, Radio, Radio Advertising. Bookmark the permalink. Other good ones (Maybe not good!) are pharmacy bags and cash register receipts at grocery stores. Nationwide Arena, Columbus, Ohio. They squeeze logos and ads in every conceivable blank space, including the arena stairs. Each individual stair is painted so that, when you look at them from the other side of the rink, you see a Wendy’s logo on each stairway.